Figure 22.3. Integration of Synaptic Activity in the Nucleus. Transcription from the BDNF promoter III requires induction of three Ca2+-responsive elements. 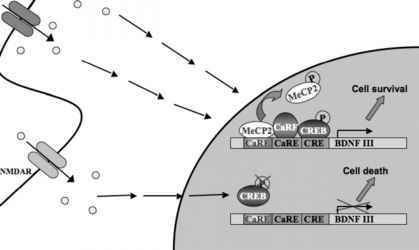 Synaptic Ca2+ influx induces CREB and MeCP2 phosphorylation, thereby binding CREB to the promoter and releasing MeCP2 from it. 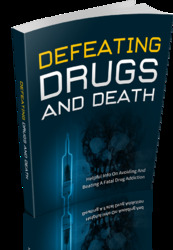 It also activates CaRF by a yet unknown mechanism. Transcription of BDNF then promotes cell survival. Extrasynaptic NMDA-receptor activation on the other hand suppresses CREB function, leading to cell death. Finally, it will be interesting to determine which molecular mechanisms are responsible for the convergence of different synapse-to-nucleus signaling pathways. The prevailing idea in recent years is that nuclear chromatin will provide the structure that integrates potentially hundreds of signals derived from synaptic activity (for a recent review see ref. 38). Among the most modified nuclear proteins are histones, the major scaffolding proteins associated with nuclear DNA in chromatin. Histones interact with each other in the form of nucleosomes, an octamer of histones, from which the amino (N)-terminal tail protrudes beyond the genomic DNA. This tail can eventually serve as a signal integration platform and post-translational modifications of the amino terminus of histones are supposed to result in long-lasting changes in regulation of gene transcription. Within this region, lysines are the most modified residues that can be acetylated, methylated, ubiquitinated, or sumoylated (for a recent review see ref. 39). In recent years also some evidence has accumulated that synaptic activity will lead to enduring modifications in the organization of nucleosomes. Several forms of synaptic plasticity that require gene transcription concomitantly require the activation of the NMDA receptor and ERK/MAPK signaling and it was therefore important to show that activation of NMDA-receptors leads to the acetylation of histone H340. The NMDA-induced acetylation could be blocked by inhibition of the ERK/MAPK cascade, indirectly suggesting a link between the activation of excitatory synapses and post-translational modifications of the nucleosome. In support of this idea is the finding that also ERK-dependent increases in histone phosphorylation were reported after glutamate receptor stimulation41. 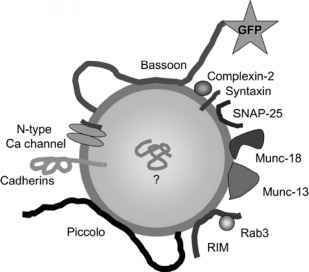 Although the exact mechanisms that regulate nucleosome modification in response to synaptic activity are still elusive, it is conceivable that the regulated accumulation of macromolecular complexes consisting of transcription factors and their co-activators will subsequently govern plasticity-related gene expression in an integrated manner. The structural basis for the assembly of these complexes could be in principle stable for a long time, which in turn is a prerequisite for long-lasting forms of synaptic plasticity. Much more work, however, is needed to fill the gaps in our present knowledge about the molecular mechanisms that control activity-dependent gene transcription.